Hunting dogs and terriers have strong prey drives and will chase smaller animals. Your dog was born with a set of survival instincts. One of those is the prey drive, an urge to chase and kill small animals. If you keep chickens, this can be a serious problem. You can’t take away this instinct, but you can certainly teach your dog restraint. Conceal a dog treat in your hand and slowly walk toward your dog to get his attention. Hold out the treat in front of his nose and begin to slowly move it backwards, so it passes over his head. As you do this, repeat the “sit” command every five seconds. Your dog will follow the treat with his nose. Eventually, he’ll sit down on his own accord in order to get a better view of that delicious treat. Release the treat and give verbal praise as soon as he parks his posterior on the floor. The trick here is to time the “sit” command so he hears it just before voluntarily performing the action you want. With enough practice, he’ll learn that performing the sitting action in response to the command has a positive outcome. Repeat the exercise once a day for 10 minutes. Once he understands the process, remove the treat from the equation and use verbal praise as the reward. Once he has mastered the sit, use the same technique to teach the drop, so you can command him to lie down. Move the treat downward to lure him into the desired position. Leash your dog. Give him sufficient slack so he can move freely, but ensure you can restrain him quickly if required. Walk him slowly toward the chickens. As you do this, give him lots of verbal praise and physical contact. This is a positive stimulus for the dog. Continue to do this for as long as he remains passive toward the chickens. Withdraw all physical and verbal praise as soon as he switches from passive to aggressive. Over time, he will learn that trying to chase the chicken results in the removal of the positive stimuli he was enjoying. This is called positive punishment. 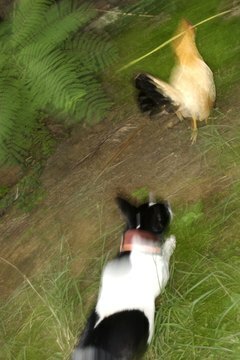 Observe your dog’s body language and use it to determine when he is likely to give chase to a chicken. As soon as he begins to strain on the leash or begins to “stalk” a chicken, issue the “sit” and “drop” commands to distract him. Use the leash to physically restrain him if at first his instinct gets the better of him. It may take a few attempts to get him to comply. Issue verbal and physical praise as soon as he does comply. Then give him a treat. This teaches him that being passive around chickens has a positive outcome, while being aggressive results in positive stimuli being removed. Walk him away from the chickens and play with him for five minutes. Repeat the exercise daily. Each time you repeat it, take him closer to the chicken. Eventually, you’ll be able to take him right up to a chicken and control his behavior verbally, with the leash as a safety net only. Keep the chickens in a pen to begin with if you think your dog may lunge before you can restrain him. Only let him approach free roaming chickens when you're confident about executing the sit and drop under such tempting circumstances. Down the Lane: How Do Pets and Chickens Live Together?